China strongly warned North Korea against additional provocations during a foreign ministerial meeting held in the Philippines earlier this month and immediately informed South Korea of the result of the talks, the foreign ministry here said Monday. Chinese Foreign Minister Wang Yi met with his North Korean counterpart Ri Yong-ho in Manila on Aug. 6 on the sidelines of a string of meetings hosted by the Association of Southeast Asian Nations. Wang also met with South Korean Foreign Minister Kang Kyung-wha on the same day. 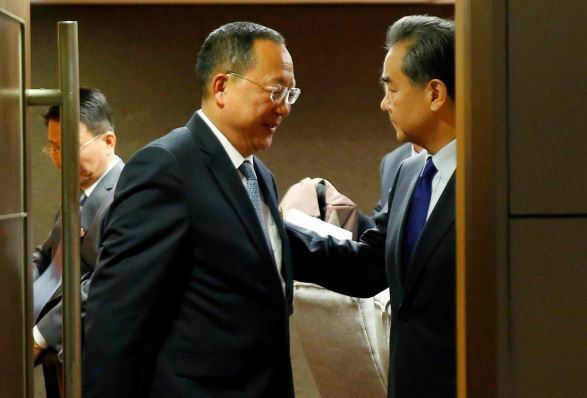 "During his bilateral meeting (with Kang), Chinese Foreign Minister Wang explained to us that he strongly warned in his separate talks with Ri that the North should stop carrying out further provocations," the ministry said in a report submitted to lawmakers here. The top diplomats of nearly 30 countries, including the US, South and North Korea joined the ASEAN Regional Forum on Aug. 7. The ARF is a rare multilateral diplomatic stage to which the North also sends its top diplomat annually. This year's ARF came after the UN Security Council adopted a fresh resolution to punish North Korea by banning its exports of coal, iron, lead and seafood in response of its two long-range missile tests last month.